No refund will be processed for withdrawals from a course or from the university after the close of business of the eighth calendar day from the date classes begin for the Fall and Spring regular session. A refund is subject to deductions for any indebtedness to the university, including payments under Title IV student aid programs. Refunds for complete withdrawal from classes are paid by check and will be mailed to the student's permanent address. Other refunds are mailed to the student's campus post office box. Three weeks should be allowed for processing. The UNA Business Office will process and distribute residual checks to those students who have received more financial aid than is needed to pay their total charges. Students should allow ten (10) to fifteen (15) business days from the date classes begin for the first mailing of residual checks. Thereafter, residual checks will be disbursed approximately five (5) to ten (10) business days from the date the funds are posted to the student's account. If payment is made by credit/debit card, refunds will be processed back to the credit/debit card. First-time, beginning FRESHMAN students should note that there is a 30-day delay on delivery of student loan funds for their first semester, due to federal regulations. Any residual amount due will be distributed approximately five (5) to ten (10) business days from the date the funds are posted to the student account. If payment is made by credit/debit card, refunds will be processed back to the credit/debit card. All residual checks will be mailed to the student's campus mailbox, if the student has a campus mailbox. Checks will be mailed to the student's permanent home address if the student has no campus mailbox. The Business Office does not hold checks for pickup. Get your refund faster with eRefunds (Electronic Refunds)! Set up your refund profile immediately to assure your funds will be deposited electronically. In order to protect your financial information, UNA does not have access to set up or view your electronic refund profile. UNA will never take money from your account unless you authorize a payment to the college. eRefunds can only be designated to an account in the student’s payment profile. This feature is not available to other authorized users. Dropping hours could affect your eligible award amount and/or cause a delay in processing your refund. If a credit/debit card payment(s) was made for your tuition and fees, the credit card may be refunded up to the amount of the payment. Any additional refund due would be issued as stated above. If you have received a residual check and have or will withdraw from any course(s), you may owe a portion or all of the residual check amount back to the UNA Business Office. You may consult with Student Financial Services in The Commons Building, room 318 to determine the effects of withdrawing from any course(s). More information on how withdrawing from courses may affect your financial aid, may be found ﻿here﻿. 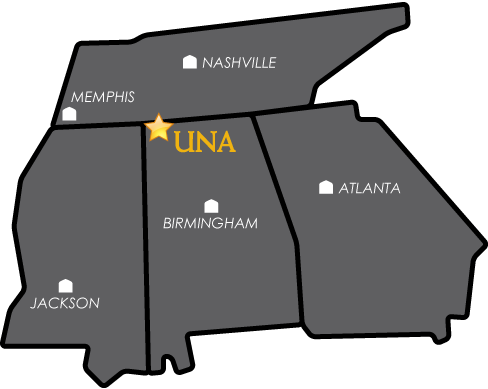 Institutional scholarships are applied toward the payment of UNA tuition and fees, on-campus room and board, textbooks at the UNA Bookstore. The total amount of institutional scholarship awards (per semester) may not exceed the cost of tuition, on-campus room, board and textbooks purchased through the UNA Bookstore when added to any other institutional scholarship. Institutional Scholarships are non-refundable and may not result in a cash payment to the student. Students who receive federal aid or non-institutional scholarships may receive excess funds. University of North Alabama Tuition Remission will be applied towards tuition first and under no circumstances be converted to cover any expense other than tuition. In no case will a combination of Tuition Remission and Institutional Scholarships result in a cash payment to the student. Students receiving federal aid or non-institutional scholarships may receive excess funds.